The brass banding tradition dates back to the early nineteenth century and England's industrial revolution. With increasing urbanization and shorter working hours, employees had more time to themselves. Employers began to finance factory bands in an attempt to decrease the political activity with which the working classes seemed preoccupied during their leisure time. Thus, the brass band tradition was born. Since the founding of the brass band tradition, improved mechanical skills in the production of brass instruments and the rise in the number of music conservatories have helped fuel the expansion of the brass banding. In Great Britain the rivalries of businesses and towns led to contests, now a large and formal series of annual contests culminating in The British Open. By 1860 there were more than 650 brass bands in England. Brass bands in Great Britain today number in the thousands, many founded prior to 1900. 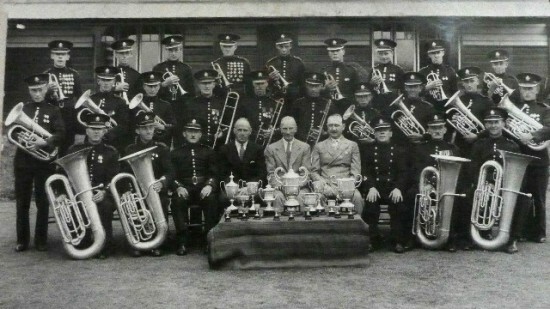 Two of the earliest bands survive to this day: Bessies O'th Barn Brass Band and Black Dyke Brass Band. In 1996 the British movie Brassed Off introduced brass banding to new audiences throughout the world. Originally in Great Britain, bands were funded by coal mines, mills and factories. Many bands retain their business sponsorship to this day. The bands were comprised of non-professional musicians who were employed at the sponsoring company. Today brass bands in Great Britain and across the world follow the tradition of being all-volunteer. Some bands have corporate, business or private sponsors but most rely on donations, fees, grants and fund-raising events. Brass bands are popular in Japan, Australia and New Zealand; and in recent years have gained a renewed popularity in Europe. Although brass bands were an important part of nineteenth century life in America, they were superseded by larger concert and marching bands, and the popular drum and bugle corps. In the United States the Salvation Army was primarily responsible for maintaining the brass band tradition through the years. Outstanding American brass bands can be found functioning as the New York Staff Band, Chicago Staff Band, Southern Territorial Band, National Capital Band, Pasadena Tabernacle Band, and Tustin Ranch Band. Lately there has been a resurgence of interest in brass banding. Today there are dozens of brass bands developing and performing in America. In 1983 the North American Brass Band Association (NABBA) held its first brass band competition, and that the contest continues to this day drawing bands from all over the nation. What makes the brass band unique is the instrumentation, the scoring of the parts only in treble clef (with the exception of the bass trombone) and the wide repertoire which ranges from orchestral works and featured solos to marches, jazz, big band, blues, novelty numbers and hymns. The instrumentation has evolved over the years to the current composition of cornets, flugelhorn, tenor horns, baritones, euphoniums, trombones, B-flat and E-flat basses plus percussion.